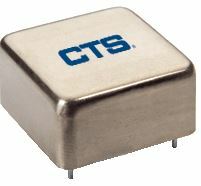 The Model 122 OCXO is an oscillator ideal for Rubidium Standard Replacement, GPS disciplined frequency standards, instrumentation, communications systems, and other long-term evolution (LTE) applications. It’s been designed to reduce power consumption and enhance stability performance through the use of double-oven and IHR (internal heated resonator) technologies. The oscillator itself is housed is 20 x 20 mm. For more information on the Model 122 OCXO, download the datasheet.